Today I am reminded of what was given by some of your generation, my generation, my father's generation and the generations before him in the name of freedom, so that my generation and your generation could do what we do in the world today. Hardly anybody seems to know why anymore, but Veterans' Day is the annual celebration of Armistice Day, which celebrated the ending of the fighting of World War I, the "war to end all wars," at 11 a.m., November 11, 1918 (the 11th hour of the 11th day of the 11th month), and Memorial Day was established to honor the Civil War Dead and all veterans before and since who gave their lives to preserve our freedoms. Each year my video production company is hired to go to Washington, DC with the eighth grade class from Clinton, Wisconsin where I grew up, to videotape their trip. I greatly enjoy visiting our nation's capitol, and each year I take some special memories back with me. This fall's trip was especially memorable. On the last night of our trip, we stopped at the Iwo Jima memorial. This memorial is the largest bronze statue in the world and depicts one of the most famous photographs in history -- that of the six brave men raising the American flag at the top of Mount Surubachi on the Island of Iwo Jima, Japan during WW II. Over one hundred students and chaperones piled off the buses and headed towards the memorial. I noticed a solitary figure at the base of the statue, and as I got closer he asked, "Where are you guys from?" I told him that we were from Wisconsin. "Hey, I'm a Cheesehead, too! Come gather around, Cheeseheads, and I will tell you a story." James Bradley just happened to be in Washington, DC to speak at the memorial the following day. He was there that night to say goodnight to his dad, who has since passed away. He was just about to leave when he saw the buses pull up. I videotaped him as he spoke to us, and received his permission to share what he said from my videotape. It is one thing to tour the incredible monuments filled with history in Washington, DC but it is quite another to get the kind of insight we received that night. The last guy on this side of the statue is Ira Hayes, a Pima Indian from Arizona. Ira Hayes walked off Iwo Jima. He went into the White House with my dad. President Truman told him, "You're a hero." He told reporters, "How can I feel like a hero when 250 of my buddies hit the island with me and only twenty-seven of us walked off alive?" So you take your class at school. 250 of you spending a year together having fun, doing everything together. Then all 250 of you hit the beach, but only twenty-seven of your classmates walk off alive. That was Ira Hayes. He had images of horror in his mind. Ira Hayes died dead drunk, face down at the age of thirty-two, ten years after this picture was taken. The next guy, going around the statue, is Franklin Sousley from Hilltop, Kentucky, a fun-lovin' hillbilly boy. His best friend, who is now 70, told me, "Yeah, you know, we took two cows up on the porch of the Hilltop General Store. Then we strung wire across the stairs so the cows couldn't get down. Then we fed them Epson salts. Those cows crapped all night." Yes, he was a fun-lovin' hillbilly boy. Franklin died on Iwo Jima at the age of nineteen. When the telegram came to tell his mother that he was dead, it went to the Hilltop General Store. A barefoot boy ran that telegram up to his mother's farm. The neighbors could hear her scream all night and into the morning. The neighbors lived a quarter of a mile away. The next guy, as we continue to go around the statue, is my dad, John Bradley from Antigo, Wisconsin, where I was raised. My dad lived until 1994, but he would never give interviews. When Walter Cronkite's producers, or the New York Times would call, we were trained as little kids to say, "No, I'm sorry sir, my dad's not here. He is in Canada fishing. No, there is no phone there, sir. No, we don't know when he is coming back." My dad never fished or even went to Canada. Usually he was sitting right there at the table eating his Campbell's soup, but we had to tell the press that he was out fishing. He didn't want to talk to the press. You see, my dad didn't see himself as a hero. Everyone thinks these guys are heroes, 'cause they are in a photo and a monument. My dad knew better. He was a medic. John Bradley from Wisconsin was a caregiver. In Iwo Jima he probably held over 200 boys as they died, and when boys died in Iwo Jima, they writhed and screamed in pain. When I was a little boy, my third grade teacher told me that my dad was a hero. 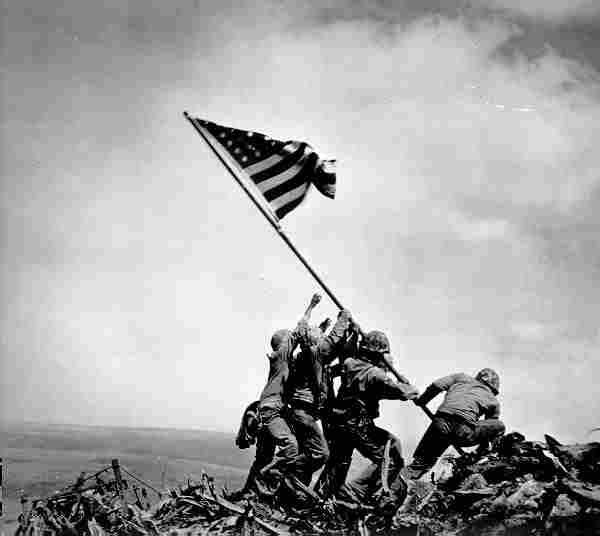 When I went home and told my dad that, he looked at me and said, "I want you always to remember that the heroes of Iwo Jima are the guys who did not come back. DID NOT come back." Suddenly the monument wasn't just a big old piece of metal with a flag sticking out of the top. It came to life before our eyes with the heartfelt words of a son who did indeed have a father who was a hero. Maybe not a hero in his own eyes, but a hero, nonetheless.